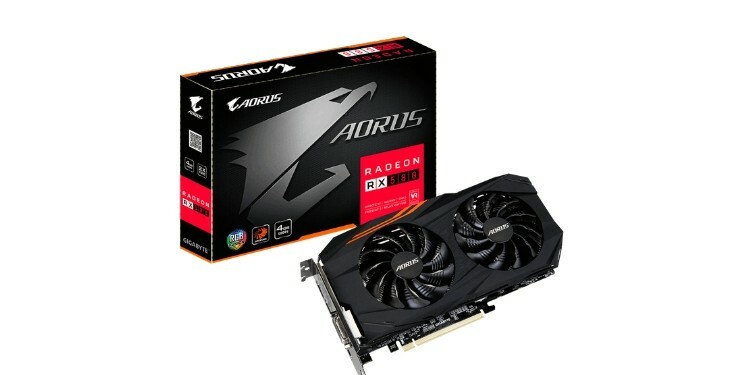 Home Reviews Buying Guides What Is The Best RX 580 Graphics Card For 2019? The RX 580 is AMD’s budget powerhouse GPU, but which version is the best RX 580? In this article, we’re going to walk you through our top five picks for an AMD RX 580 GPU. If you’re still buying an RX 580 graphics card in 2019, chances are you’re doing so to take part in AMD’s excellent Raise The Game promotional offering, or just want a cheaper alternative to the GTX 1660. Regardless of your reasoning, we’ve gathered up the best options for the AMD RX 580 here, and we hope you find one that is right for you! If you have any questions about the RX 580, our RX 580 reviews, or just aren’t sure which card to pick, scroll down to the bottom of the article. We have a detailed buying guide there that should answer your questions. If you still have questions after that, you can also leave a comment, and we’ll get back to you as soon as possible! How Does The RX 580 perform in games? What about AMD’s Raise The Game promotion? What is the RX 580 MSRP, and how much should I be spending? Do the width and length matter? The first pick on this list is the cheapest, but comes with a few key sacrifices. First and foremost, you won’t be able to take part in AMD’s game bundle, as this is not one of the supported models. If you’re interested in playing Devil May Cry 5, Resident Evil 2 Remake, or The Division 2, purchasing one of the cards with the bundle included is a very smart way to spend your money. If you don’t want the bundle, or your budget simply caps out here, then this is still a fine card. That being said, this GPU will only be suitable for 1080p workloads. While you should still be able to achieve 1080p and max settings at 60+ FPS in modern games with this card, a few heavier titles may lower your frames at maximum texture detail due to lower VRAM capacity. This is an… interesting card. It’s more expensive than a Radeon RX 580 8GB, but unlike a lot of 4GB 580s being sold on Amazon, it still supports the AMD game bundle. Additionally, this card is actually the smallest RX 580 currently available on the market, and boasts RGB lighting to boot! Seems like a pretty premium product, right? Well, as alluded to above, this is a 4GB RX 580 model, which means its 1440p performance will be severely limited. If you go with this card, you’re buying it to have a small 1080p gaming card with RGB lighting, not necessarily for its performance-per-dollar. If value is what you’re looking for, we recommend looking at our next entry. If you want the best RX 580 for the money-- and arguably the best value GPU on the market-- then this RX 580 may be the right one for you. At the time of writing, it’s retailing for about $190, which is well below the ~$230 that the GTX 1160 starts at. The 1160 only has a performance advantage of about 15 percent over this card, and it doesn’t have AMD’s game bundle, which is offering your choice of two out of three cutting-edge AAA games from Ubisoft and Capcom. 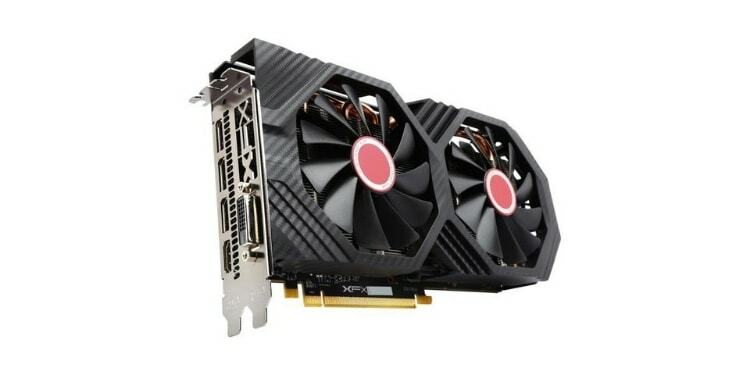 This is the cheapest RX 580 8GB, and easily the best for most players. If you want more performance, or all three of the games on offer in the bundle… keep reading. Otherwise, you’re probably set with this card. The biggest departure that this card has over its fellow RX 580s is its aesthetics. I mean… look at it! 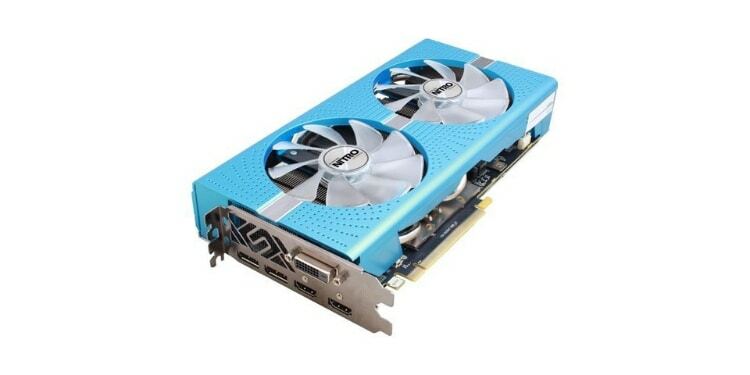 Boasting a powder blue shroud, white fans, and the longest length of all the cards on this list… the Sapphire Nitro+ RX 580 is sure to raise quite a few eyebrows. Depending on the rest of your hardware, this card can blend into a perfect arctic theme or stick out like a mirror in a desert. If either of those sound preferable to you, then this card may find its way into your rig based on its aesthetics alone. 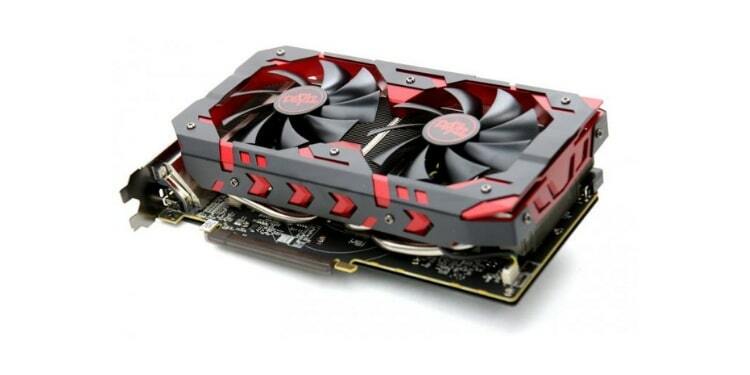 Last but not least, the PowerColor RedDevil RX 590. And to that I say,”Shhh!!! We are trying to gaslight you!” Seriously though, ignore the marketing. The RX 590 is very literally just an RX 580 with an incredibly souped-up clock speed, heatsink design, and price point. While you’re unlikely to achieve the RX 590’s level of performance with a user-end RX580 overclock (unless you’re incredibly lucky with the silicon lottery), these cards are still close enough that we’re comfortable putting them in the same article. 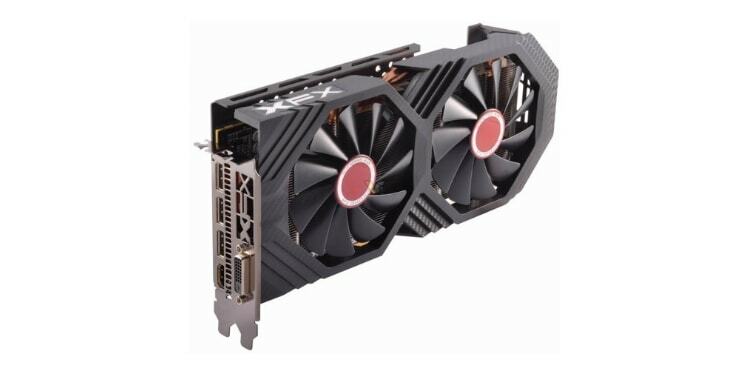 Plus, there’s a total of two RX 590s on the market right now, it’s a very niche card. It’s not exactly worth its own article. Putting semantics aside, the RedDevil RX 590 does boast some key advantages over the other cards on this list. Namely, that hefty overclock translates to a roughly ~17% performance boost, which makes it equivalent with the GTX 1660. For the extra $10 you’re paying for this card over the 1660, you’re getting all 3 of the games offered in AMD’s Raise The Game Bundle, instead of just two. That alone makes this card a pretty great deal, in our opinion. The only real downside of this card is its unreasonable size. In order to push the RX 580’s GPU this far, the RX 590 requires a triple-slot cooler design and doesn’t really save on length, either. This card is pretty large, and using it will mean that you’re likely to lose a few of your PCI slots in return. If you don’t know much about buying a graphics card and aren’t sure which RX 580 to buy, don’t worry: we have you covered. Below, we’ll explain the performance you can expect with any of the graphics cards we have listed above. In general, you can expect the RX 580 to perform at anywhere from 60-100 FPS in modern games at 1080p and high/max settings. This lowers to 40-60 FPS in 1440p at the same settings in more intensive modern games, but even titles like Devil May Cry 5 can be maxed out at 60 FPS and 1440p with this graphics card if you’re using the 8GB version. The RX 590 is pretty much the same story, seeing boosts of 10-15 FPS over the RX 580 in most scenarios. This is because the 590 is actually just a highly-overclocked refresh of the RX 580, not necessarily a tier up or a generational leap. For that reason, we’ve decided to include an RX 590 in our selection above. To see detailed RX 580 benchmarks and RX 590 benchmarks in the most demanding games of today, click here. As you may guess, more is better. But to be specific, the main difference between the 4GB and 8GB models of the RX 580 will be how well they handle higher resolutions, like 1440p. The 4GB RX 580 should perform just about the same as an 8GB 580 in most 1080p games, but when playing in 1440p, you’ll need all that extra VRAM. To better future-proof your card, it’s best to pay a little extra for the 8GB RX 580 or RX 590. If you only plan on using this card for about a year, or if you’re sure that 1080p is okay, then 4GB will be fine. In terms of game bundles, this is actually fairly strong. All three of these games have been well-received critically, are basically brand new, and have amazing visuals and performance on PC. In the case of RE2Make and DMC5, RX 580 users can expect to max out these games at 1440p and 60 FPS… as long as they have the 8GB version, of course. With a supported RX 580, you get to choose two out of the three games above. With an RX 590, you get all three. If you planned to buy these games anyway, the RX 580 has a very compelling value here- you’re essentially getting the GPU for anywhere from $60 to $180 off! This promotion won’t last forever, though: it ends on April 6th, 2019. The RX 580’s MSRP is $220, and the RX 590’s MSRP is $280. Both cards have plummeted in price significantly, though: the RX 580 is now frequently found below $200, even with full 8GB VRAM, and the RX 590 can be found for under $250. At these prices and with the Raise The Game Promotion, both cards serve as an excellent buy. At MSRP, though, both cards lose to the GTX 1660 and GTX 1660 Ti. This is worse if you aren’t interested in any of the three games included in AMD’s Raise The Game promotion. The factory overclock of a given card generally won’t result in a dramatic change in performance. Your own overclocking may push it a bit farther, but even then don’t expect anything better than a 10% performance boost, all at the cost of louder and hotter operation. If you don’t plan on doing any overclocking or GPU tweaking of your own, though, picking a card with a higher out-of-box factory OC may be a worthwhile investment. Width refers to the number of PCI slots the card takes up in the chassis. Your typical graphics card will be at least a two slot, but some may be a three slot. With the way most motherboards are configured, a graphics card can generally take up two slots without obstructing the next PCI slot down, but 3-slot cards will almost always result in losing at least one extra PCI slot. Since most people only use their expansion slots for a single GPU, though, this isn’t really a problem. Length, however, is important for any PC build. We’ve provided length measurements in millimeters alongside each of the recommended GPUs– be sure to check your case manufacturer’s specs to make sure it can fit! You don’t want to buy a GPU that’s too long to fit inside your chassis, and not find out until you attempt to install it. In Full Tower and Mid Tower ATX cases, this will almost never be a concern. With Micro ATX and Mini ITX PC builds, however… double-check to be sure. Hell, triple-check while you’re at it.